This are animations, made by me. They are first experiments and I hope you like them. It can take a while to load them, so please be patient. Please don't use them without asking, it took a lot of time and work to make them. For the next one and this above at the right, you need to install Flashplayer. You need Flashplayer to see this animation. It was made on the occasion of the opening in 1997 of the new exhibit for penguins "Vriesland" in the zoo of Antwerp (Belgium). I got permission to use it here and have made a videoclip for it. The song is in Dutch, so maybe you don't understand much of it, but I made a free translation (no rhymes or rythm), so you can still understand the context. Curious? Then you can listen to it, by clicking on the picture. Just one remark: It only works if you have installed Flashplayer! Click here or on the picture to start. en gaan heel vaak op reis. maar meestal op het ijs. ja, hij heeft me in z'n macht. naast hem voel ik me zo klein. 't zou hier veel plezanter zijn. aan z'n neusje, da's uniek. 'k zou de hemel dankbaar zijn. in de sneeuw, daar wil ik zijn. ik was even van de wijs. ik begaf me op glad ijs. want ik vind het al te kras. nee, dat had ik niet verwacht. 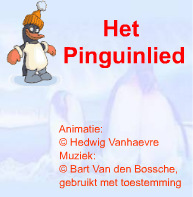 'k word een pinguïn, dat staat vast. dan heb ik van niemand last. and travel a whole lot. but even more on the ice. yes, he has a hold on me. beside him, I feel very small. it would be much more fun here. on his nose, that's unique. I would thank heaven for it. in the snow, that's where I want to be. I walked on slippery ice. because it is a bit thick. that I was a penguin. no, I didn't expect that at all. even when I was so small. I will alter as a penguin, that's for sure. then no one will give me any trouble anymore.